And yes, Dave, I'm sorry. I have been attending shows at Kelham Hall for a decade - but somehow the A1's lack of junction numbers can still leave me confused. Jinxed from previous visits, we were on schedule this time at least not to be late ... then somehow just cruised past the junction and on for about 15 miles before even realising. In total, the unscheduled round trip was 45 miles. Fantastic! Why does this nonsense happen? Ah, well. Thanks to everyone for their help and patience. Tell you what, though ... like all the recent Partizans, it was a great day, once we got going. And that's the main thing. 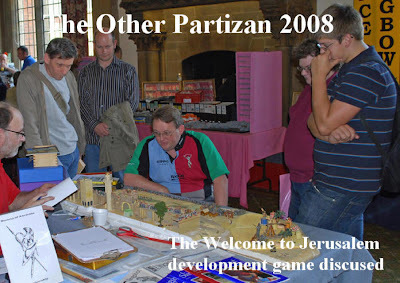 Historical wargaming, and meeting fellow enthusiasts. I had first devised this game in time to do the shows circuit back in 1999, the 900th anniversary year of the city's fall. 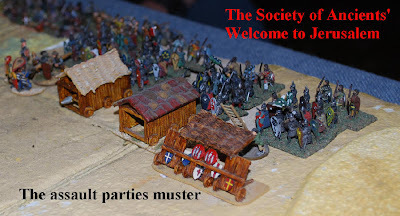 After a fair bit of experimentation with (then) fashionable rules, I opted to write the scenario around the more traditional Medieval Warfare by Slim Mumford (so-called Mumford's Siege Rules ...). These are still available from the Society of Ancients, and are a classic. 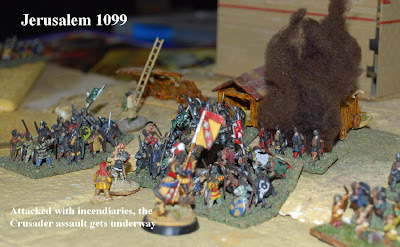 The nearest contemporary equivalent would be Warhammer Ancient Battles: Medieval Warfare assumes you use individually-based figures and retains that skirmishy feel, with characters dicing for hits, making saving rolls for armour etc. - but with very little instruction on how to play (just a framework of mechanisms and modifiers around which you have to develop your game yourself ... ).. Ideal for adapting to scenarios, and lots of ideas for the big equipment already built in for assault games. at the top of one ladder! 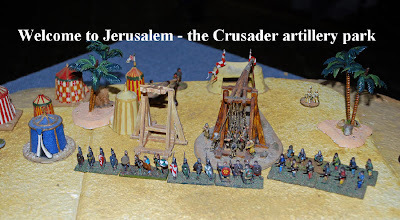 The Crusades is also one of those eras rich in heroic personalities - and, like the medieval chronicles we base them on, I think we really want the Bohemonds, Stephens and Godfrey de Bouillons of legend to shine through our games. 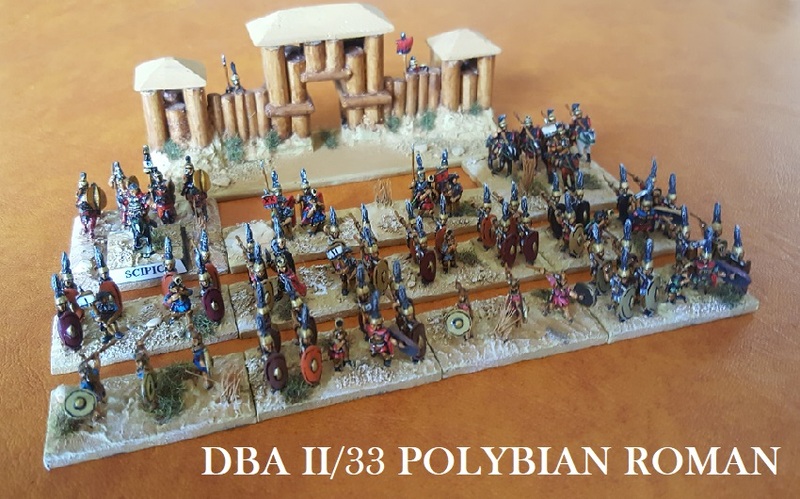 So any scenario or adaptation will need to balance the modern player's desire to use armies based up for current (often quite abstract) battlegames with the asymmetries of siege warfare and the dynamic contributions of the individual. 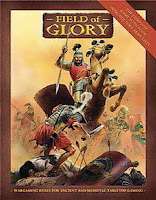 There has been chat, on one forum or another, of whether the very new Field of Glory might work for a siege game - and in terms of its actual game structure, no obvious reason why it wouldn't. And the equipment built for the Jerusalem assault has long been gathering dust. It seemed like a worthy challenge. So, with limited space and a lot of question marks, we set up a very simple array - a shallow playing area with some assault parties lined up ready to go, a modest artillery battery to worry the defenders, and some homesick Fatimids lining the walls (determined to keep the Franks out - but unlikely to hang around once an incursion was achieved). Each part comprised the equipment and/or markers (rams, ladders, axes, mantlets etc.) and a BG's worth of conventionally based Normans to indicate the strength, take the casualties and do the fighting. The main function of the colossal Beam Slings would be to cause Cohesion Tests on the defenders (the odd 'disruption' result being likely to influence the chances of the ladders parties..).. The defender artillery were equipped with incendiaries - we decided a simple Complex Move Test (pass or fail) would be sufficient to indicate whether an artillery group's shooting going to be normal or volatile ... the volatile hits igniting the target and causing extra panic for the crews. Well, suffice to say this was just a preliminary outing - a chance to give it a go and get some opinion as much as anything. 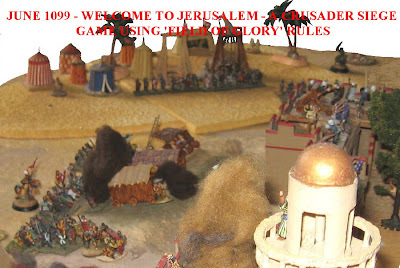 We were able to play through the sequences enough to see that the game will work, Field of Glory will provide a suitable platform, and that the Crusader siege of 1099 has lost none of its appeal to the showgoing enthusiast. I will update information as this project progresses - and assuming it is all working, will build up the FoG Siege Game resource as problems are solved/fixed. Follow it here, and I will let you know as/where material gets collected. Thanks to everyone who helped or took part - whether playing or chewing over some of the ideas. I got a lot out of both forms of involvement, and I hope you will join in again. We are going to do all this again on Sunday, on the Society of Ancients stand at Colours (Newbury Racecourse - see the link in the side panel) ... Come along and join in if you are free. Thanks to Chris for his assistance, figures and pictures - and thanks, too, Mike T. for some excellent ideas.